What a pleasure to have you on board the latest JoyTunes Webinar! I hope it provided new ideas and inspired you to carry on your revolutionary, 21st-century piano teaching. Decide Now – the duct tape app: a must in your gamification tool box. Play Piano Charades at your next group lesson! Camera – comes “free” with your iPad, don’t forget its power to command focus unlike anything else. Flashnote Derby – best app to isolate and review note names. Multi-Touch Whiteboard – an irresistible doodle pad to review basics. Purchase forScore from the App Store. Tap on the Curriculum document and it will prompt you to “Open In” various apps. Choose the “+” and it will automatically download the Pdf into the forScore app. While viewing the Curriculum Guide, tap on the link to a song. Tag each Pdf with the correct chapter number and place within the JoyTunes library. Notion – the best app yet for notating compositions on the iPad. Orphion – terrific app to spur melodies for future compositions. Octavian Basics and Octavian – reference tool perfect for advancing students with theory assignments. iReal Pro – for generating lead sheets, backing tracks and so much more. Dropbox – for sharing assignment sheets, videos and documents. Moosic Studio – hands down the best iPad studio management system for music teachers. Pages – best document generator on the iPad–comes free with the latest iPads. Clavier Companion – avoid more paper and get the digital edition. MusicTeachersHelper.com – your dream assistant and billing system all at one place. MyMusicStaff – a new kid on the block ready to assist your every studio management need. Take a moment to visit the 88PianoKeys.me Music App Directory if you are looking for an app to meet a specific need. In addition, please let me know if I’ve forgotten to include your favorite app in my directory. Ask to join the JoyTunes Teachers group for more tips and support with Piano Maestro. Ask to join the iPad Piano Teachers group. 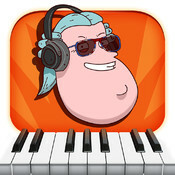 LIKE these Facebook pages: iPad Piano Studio and 88PianoKeys. One more thing: looking for a guide to help you build a studio that will set yours apart? Check out The iPad Piano Studio: Keys to Unlocking the Power of apps. This is so awesome! All I want to do is sit down and play with all this! Thank you so much for the information, Leila!